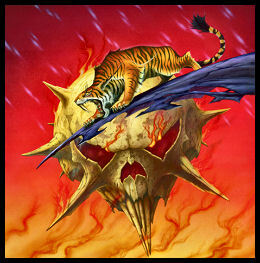 Review: "Tygers Of Pan Tang: Ambush" - Sea of Tranquility - The Web Destination for Progressive Music! Ambush is the latest studio album from Tygers of Pan Tang, a band that were very much at the forefront of the NWOBHM scene both in terms of influence and inspiration, and finds them reunited with legendary producer Chris Tsangarides. As founder member guitarist Robb Weir was at pains to point out when Sea of Tranquility spoke with him a couple of months ago Tsangarides has added that special magical ingredient that makes Ambush a very special album. Since Robb put the band back together at the end of the 20th Century the Tygers have made some impressive new music and this proves no exception. Not that they don't give a very definite nod to their past with the infectious 'Hey Suzie' - a brand new song from the pen of drummer Craig Ellis it revisits the story of the leading lady from 'Suzie Smiled', one of the bands most cherished anthems that dates back to 1980's Wild Cat. A great reminder for their long term fans of a time when the Tygers distinctive logo adorned the back of many a denim jacket at your local rock disco. Packed full of classic rock riffs and driving rhythms ('These Eyes', 'Speed' and 'Play To Win' to name but three) what every great rock song needs is a vocalist that has the voice and presence to deliver the goods. Fortunately in Italian born vocalist Jacopo Meille the Tygers have the perfect man for the job and his performance here is truly exceptional and he fully deserves to be mentioned in the name breath as some of the great hard rock vocalists of the past. With superb artwork from Rodney Matthews this truly is a first class effort from all concerned and proves that the Tygers of Pan Tang still have plenty to roar about. For long enough, veteran rock acts were ridiculed, vilified even, with talk of dinosaurs, has-beens and irrelevance. However in recent years, bands like Saxon, Savage, or Uriah Heep even, have been releasing albums every bit as good, or day I say, better than in their supposed heyday. Well add to that ever burgeoning list NWOBHM legends Tygers Of Pan Tang, who with their new album Ambush have stayed true to their roots, while expanding their sound. I'm not suggesting a wheel reinvention here, but the blend of classic rock ala Thin Lizzy, boogie in the vein of AC/DC, a US commercial edge that is Dokken-like and a sassy, classy Little Angels-ish vibe, makes for an album that rocks, rolls and convinces from start to finish. With the only original member left in the ToPT ranks being guitarist Rob Weir, respected producer Chris Tsangarides reacquaints with the Tygers to add authenticity. With the results being an album that not only sounds fantastic, but one that comes across as retro and current at the same time. A neat trick that many try, but with which few succeed. "Keeping Me Alive" kicks things off in urgent style, riffs flying everywhere, vocalist Jacopo Meille belting his lungs out, before the clever pings, boings and sploings that flit in and out of the George Lynch like riff of "These Eyes" brings a classy, yet hard rocking sheen to proceedings. Highlights abound, with the catchy as hell "Mr Indispensible" grooving like a good 'un and "Hey Suzie", which revisits an old lyric from Tygers days gone by, having a really confident strut and pout about it. And the temerity to have a bit of vocoder for added effect! Whether it is the bouncing "She", the pulsating, yet commercial "One Of A Kind", or the classic riff n' roll of "Speed", what hits you most is just how tight a band ToPT are these days. Bassist Gavin Gray and drummer Craig Ellis never miss a beat, while Weir and Dean Robertson riff and solo like their lives depend on it. Add Meille to the mix and his soaring, clear, bristling vocals become the icing on top of an already irresistible cake. Ambush is an album capable of knowingly nodding at the history of Tygers Of Pan Tang, while presenting their plan for the future. Ultimately however, it is a classic rock album that covers a variety of styles in confident, assured fashion. And who can ask for more than that? Rocksector Records are certainly creating a niche in the Rock/Metal market which continues with the release of the excellent new album by the Tygers Of Pan Tang, Ambush. Many would argue the relevance of the Tygers in 2012. With only one original member in Robb Weir, flying the Classic Rock flag with vigour and pride, the once stalwarts of the NWOBHM movement are keeping their legacy intact. Let's face it Lynyrd Skynyrd and Thin Lizzy seem to be doing fine so if a legacy is treated with dignity and the material is of excellent quality then why the hell not continue. Italian vocalist Jacopo Meille, brings a Jeff Scott Soto/Robert Plant feel to his delivery,which is very much 'Rock Star' personified.Opening track 'Keeping Me Alive' and 'These Eyes' come storming out of the blocks delivering exactly what's expected from the twin guitar masters of Robb Weir & Dean Robertson. The whole album oozes quality, to which some credit must go to the knob twiddling abilities of Chris Tsangarides (Judas Priest/Anvil/Thin Lizzy) who captures the essence of Tygers perfectly. A well-paced tour- de- force, with fist pumping anthems 'Hey Suzie' and album closer 'Speed'sees us truly dust down the denim patched jackets. Ambush, sees the Tygers Of Pan Tang firmly putting the 'Classic' back in Rock music, ensuring the legacy remains in safe hands for many years.